Last night I signed up for a free trial of eFax. I only needed to receive one fax, so the free trial seemed like a good option. This morning, at 7:30am I started receiving calls from (323) 860-9200. I didn’t answer any of them, and each call resulted in a voicemail about 30 seconds in length, of someone in a call center breathing. I don’t know what this is about, but there is absolutely no reason for this company to be calling me at 7:30am roughly 10 hours after I signed up for a FREE 30 day trial. Stanley K.: Hello, David. 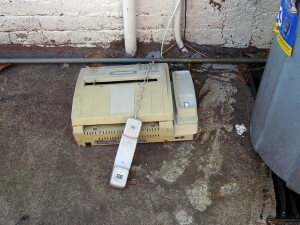 Welcome to online Fax support. I am Stanley Kox, your online Live Support Representative. How may I assist you? David: I’ve been receiving repeated phone calls from an eFax number this morning, since signing up for my free trial. David: What is prompting these early morning (7:30am) phone calls from your company? Stanley K.: I absolutely understand your concern and sincerely apologize for the difficulty that you have encountered. Stanley K.: We need to make verification to make sure that the accounts belong to the customer or not. Stanley K.: If the account does not belong to you then we go ahead and close the account to avoid any future issues. David: So, you need to do this in addition to all of hte information and valid credit card information I’ve already provided? Stanley K.: We are sorry, that you received the calls in the early morning. Stanley K.: We will make sure that it will not happen again. I think I’ll just cancel. It isn’t worth the early morning wake up call! This entry was posted in Deception, Internet, Spam and tagged 3238609200, annoying calls, efax, spam on December 12, 2012 by David.